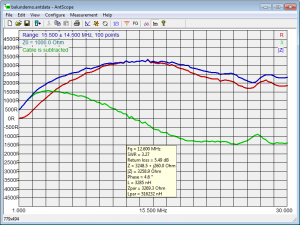 The instrument used for this demonstration is a Rigexpert AA-600, and its PC client Antscope. For convenience in measurement, I will use a pair of adapters as a test fixture, a N-M to BNC-F and BNC-F to binding posts. 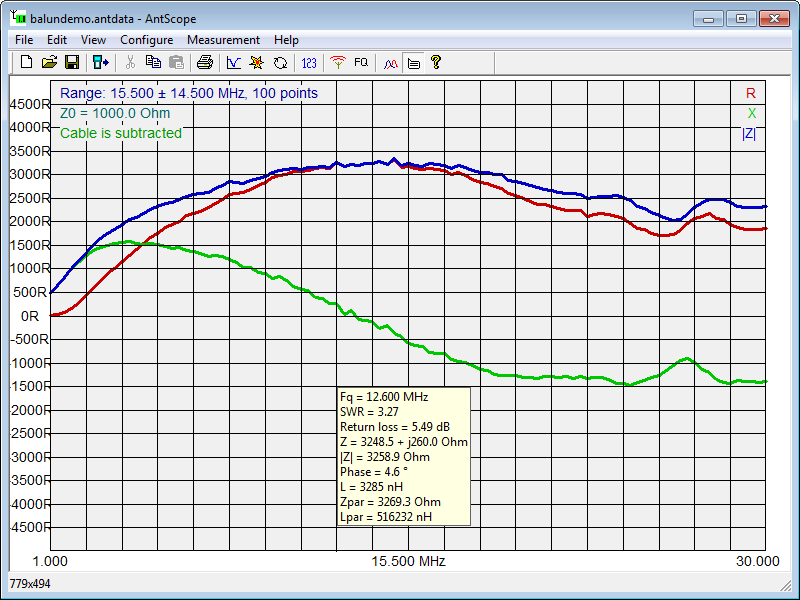 This adapter will of course affect measurements, so it is desirable to try to remove their effect as much as possible. 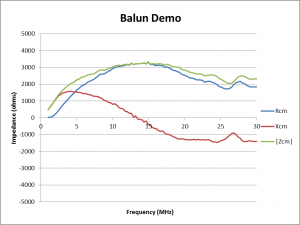 The classic method of removing the effects of the test fixture is the SOL calibration process of VNAs. 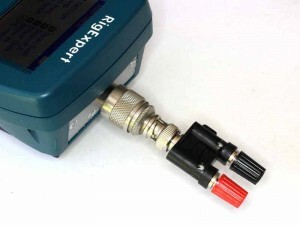 Most hand held Antenna Analysers are not capable of SOL calibration so to generalise the method, the AA-600 is used in that way (though it is capable of SOL calibration for better accuracy). First step in the process is to take a scan with the adapter in place and nothing attached to the binding post. 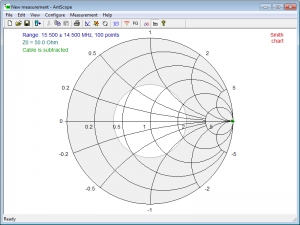 The scan is viewed as a Smith chart with System Impedance or Zref set to 1000Ω. Ideally, a scan of an open circuit would result in a dot at the far right end of the X=0 line. That is not the case due to the adapter. 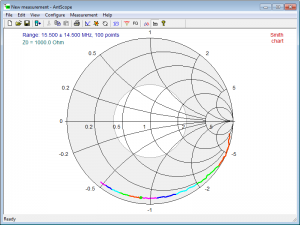 You could take the view that since the locus of the Z measurement is approximately an arc, it could in this case be following a constant VSWR circle, or a constant G circle. 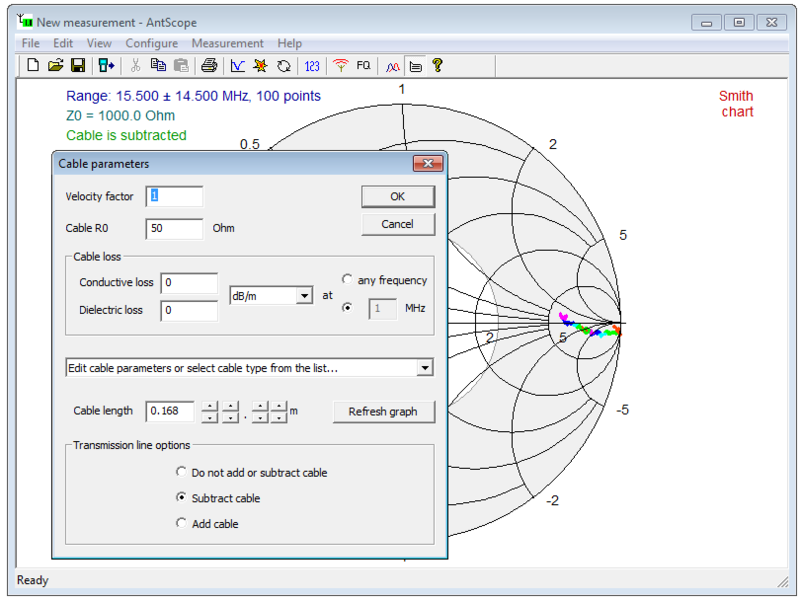 There is not a lot of difference in the quality of the approximation in this case, and although it might seem that the first approximation is easier to back out than the second, the second can be backed out to a fair extent using Antscope’s transmission feed line feature. 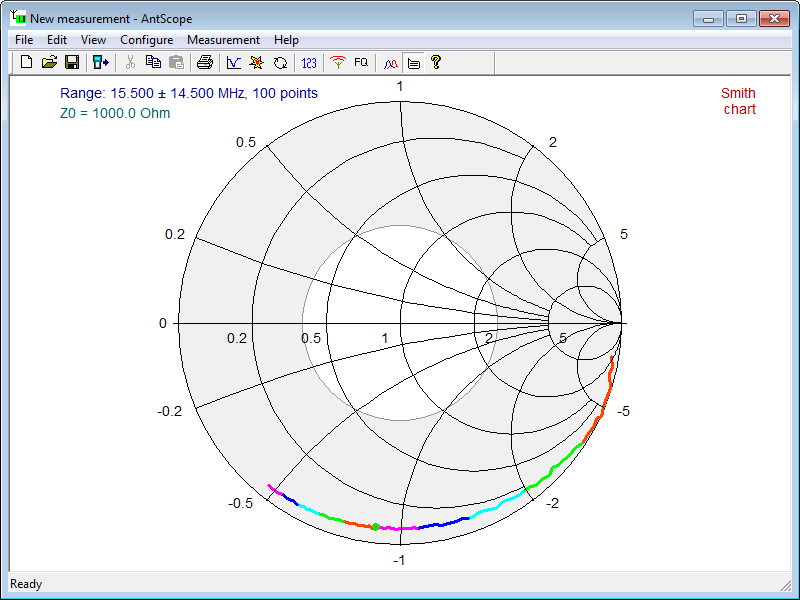 Above, using subtract transmission line, a zero loss feed line is adjusted in length so that the locus of Z is as close to a dot at the right hand end of the Z=0 axis as possible. The Zref=1000 is an exaggerated view to make adjustment easier, lets restore it to Zref=50. 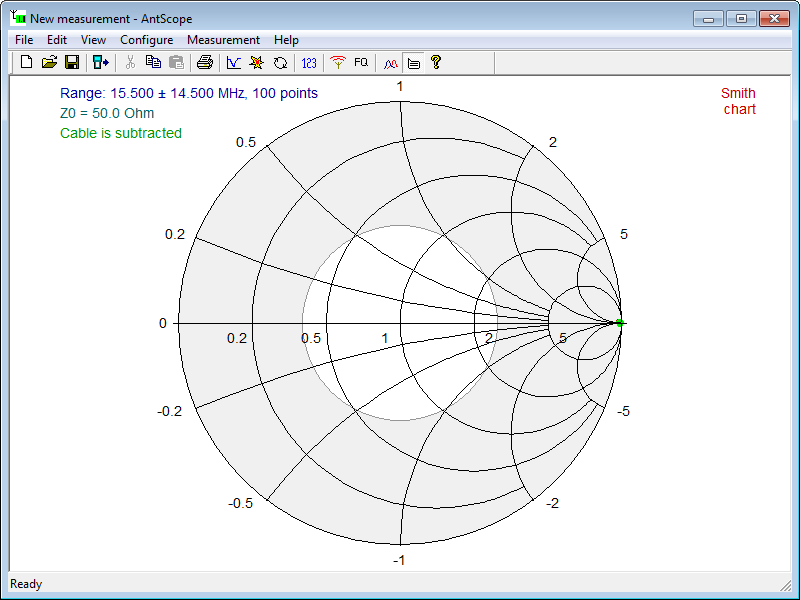 Above, the Smith chart plot of an open circuit using the subtract transmission line feature to back out most of the effect of the adapters. 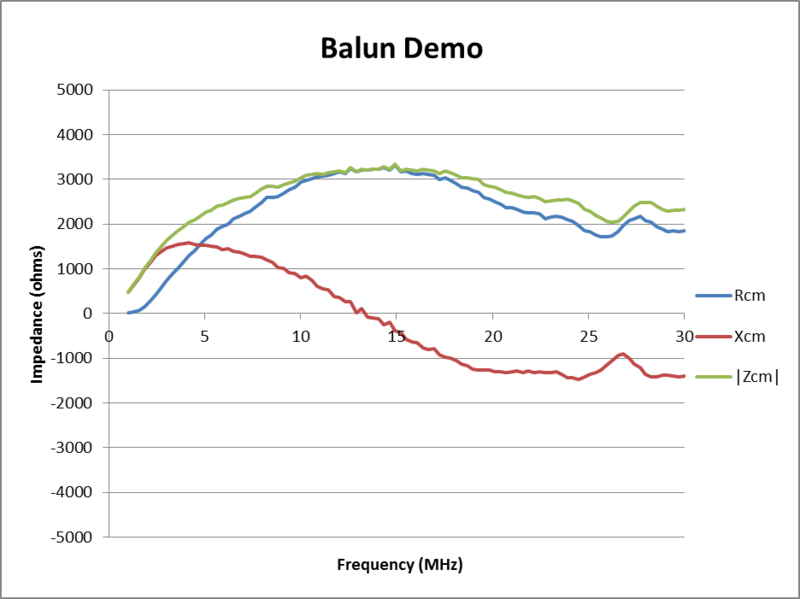 Now to measure a sample balun which has both wires joined at each end, and then the ends are connected to the binding posts. Above, the rendering of a CSV export in Excel. 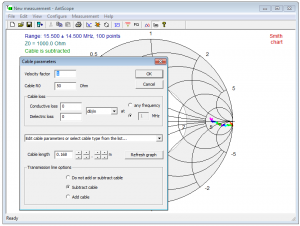 The method can be used with other analysers or VNAs that are capable of subtracting transmission line. Of course, the instrument MUST directly measure the sign of X, otherwise it is guesswork (see The sign of reactance).